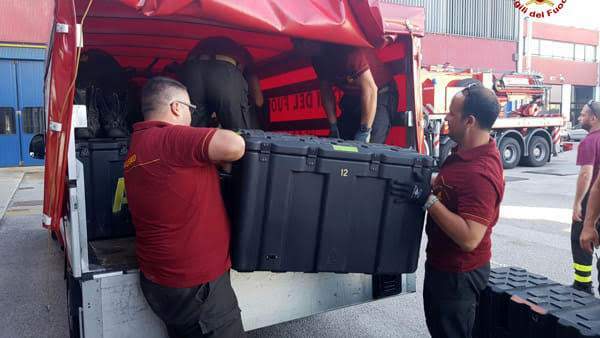 As part of the European Civilian Defence, CP Cases provides military standard Amazon cases to to the Urban Search and Rescue teams (USAR) of the Italian Ministry of Interior. These specially trained and equipped teams from the Italian Fire Service, carry special kits each of which are protected and transported by Amazon cases appreciated by the USAR teams for their sturdiness, capability to sustain rough handling and to carry heavy loads. Moreover, USAR teams are called to move via airlift at short notice, fully exploiting the capabilities of the Amazon cases for both civilian and military air transport as well as specific fit for purpose on the 463L aeronautical pallet. The future co-ordination and set up of more USAR teams is still an ongoing process and likely to be followed by other specialty crew for Chemical, biological, radiological and nuclear defence (CBRN) and scuba / underwater. These will be implemented on an annual basis as soon as the budgets become available.